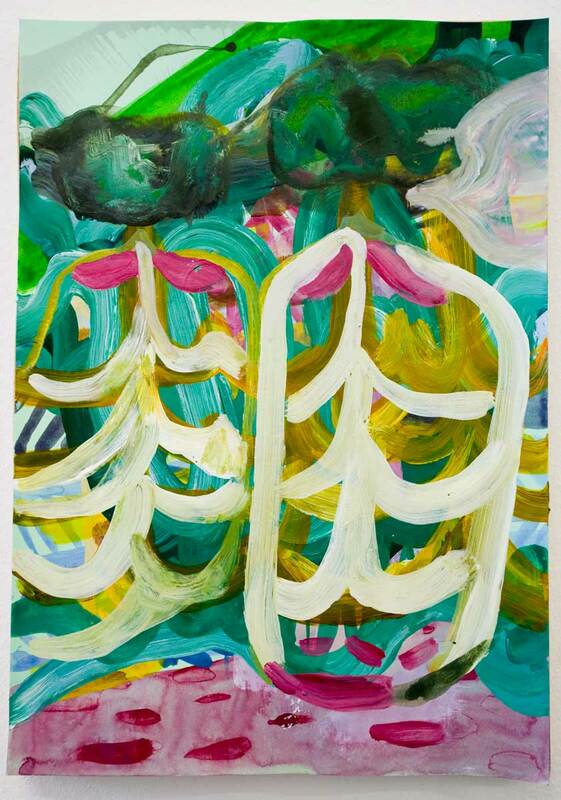 Art Britannia explores contemporary practice from UK with an emphasis on painting and craft. The exhibition features a ‘mini show within a show’, taken directly from The Lion and Lamb Gallery’s ‘Summer Saloon’ exhibition. Art Britannia featured artists include: Charlie Billingham, James Capper, Gordon Cheung, Freya Douglas-Morris, Brad Grievson, Sam Jury, Hannah Knox, Mary Ramsden, John Robertson, Guy Rusha, Dolly Thompsett, Rebecca Ackroyd, Eleanor Moreton, Henny Acloque and Grant Foster. Curated by Ben Austin (London) and produced by Karelle Levy (Miami), Art Britannia runs from 1 December to 21 December 2013. 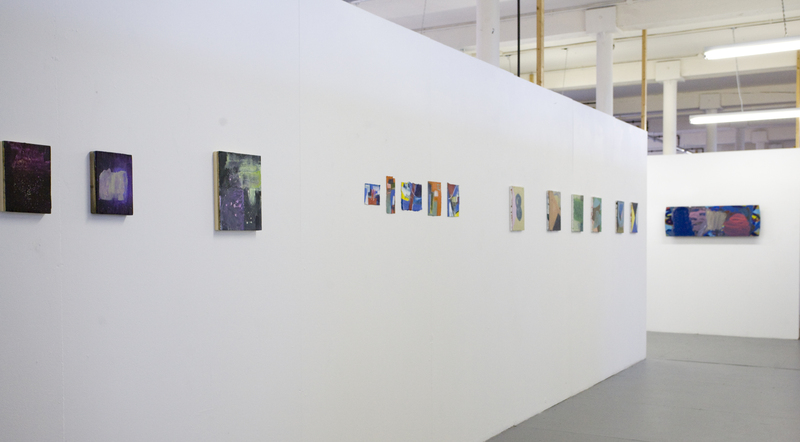 Painting Too, at Harrington Mill Studios, forms part-two of a duo of shows about abstract painting, demonstrating that, to quote its curator David Manley: “current abstraction is in rude good health”. If part-one, featured that strand of abstraction that foregrounds a “formal” as opposed to “informal” approach, part two concentrates on the other strand, work that is looser in execution, more “provisional”, “casual” “informal”, more Romantic than Classical, or possibly even, more Dionysian than Apollonian. The most provisional are Vincent Hawkins playful paper cut-outs and paper folds that might be the biproduct of some other process, as if the paper that he was resting on has become an event in itself, rather than being discarded it is presented as uncomposed image, unconscious design, a strategy similar to that of displaying a used artists’ pallet as a painting. I love their simplicity (of sorts) and audacity, and the challenge they pose to my preconceived ideas about what a painting might be. The folded works bring attention to the way a painting might be more a construction than a composition, and even though I started out thinking of these as ‘provisional’ or romantic my distinction already breaks down as I see connections to the constructivist tradition, which for me adheres more readily to the classical pole. Rachael Pinks‘ works on paper, made from pages torn from second hand books and painted, are more consciously constructed than Hawkins’. I feel invited to get up close and study them, and as I do so I find detail that fascinates me just as I might do if I was viewing a miniature. I read them as abstract miniatures, a notion that would have been unthinkable say twenty years ago. This seems to me to be one of the things that makes them contemporary. In this show, they are simply attached to the wall, unframed, bringing my attention to the slightly irregular shapes of many of them, emphasising the way they have grown into being, if not quite organically, rather in a dialogical fashion, in conversation between artist and material. That they are grouped so closely together also highlights the off-straight edges and the relationships between pieces. 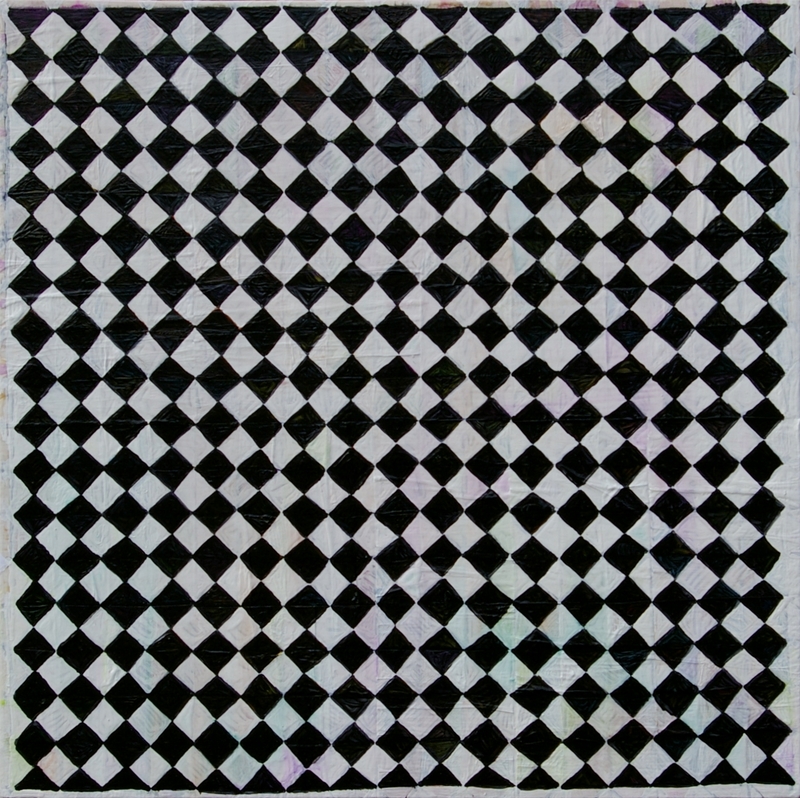 Stephen MacInnes’s decorative 12″ x 12″ paintings on paper from his ‘long series’ are also organised together for maximum effect, creating an impressive tiled wall of arching forms. Works that might have looked casual take on an architectural quality. 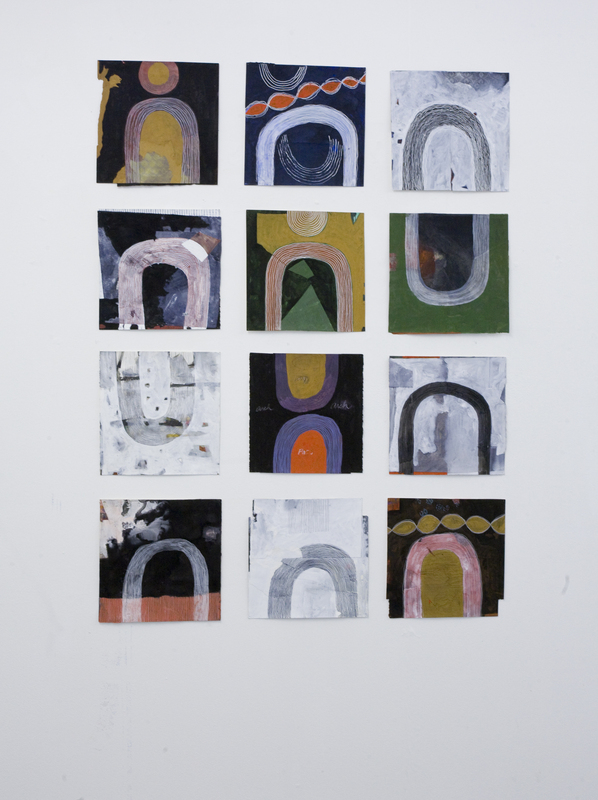 Rachael Macarthur‘s small works on paper, again unframed and simply attached to the wall, seem closer to Hawkins in their nearness to the provisional or at least casualist approach. Seeing Tabula Rasa again confirms my appreciation of this piece, I continue to feel surprise at how something so slight can have such an impact. There’s a lot more going on in Russia, there is more drawing, and like Pinks’ little paintings/collages there are landscape associations, but they are residual, the sense I have is that the more the painting attempts to capture a memory of something, the more it resembles only the process of attempting to recall. Terry Greene‘s paintings have a casualness about them too. 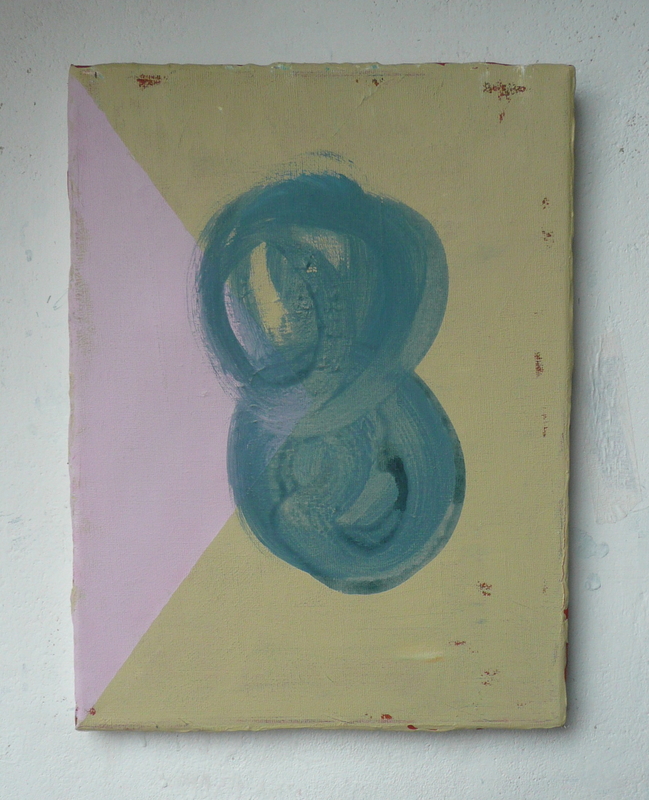 They look like the paint was applied quickly, perhaps in an attempt to prevent the conscious mind from interfering too much in the process, yet with time gaps between painting sessions, creating for the artist opportunities to study them, to reflect and even to forget, whilst for the eventual viewer, layers of underpainting slow down the resulting image. 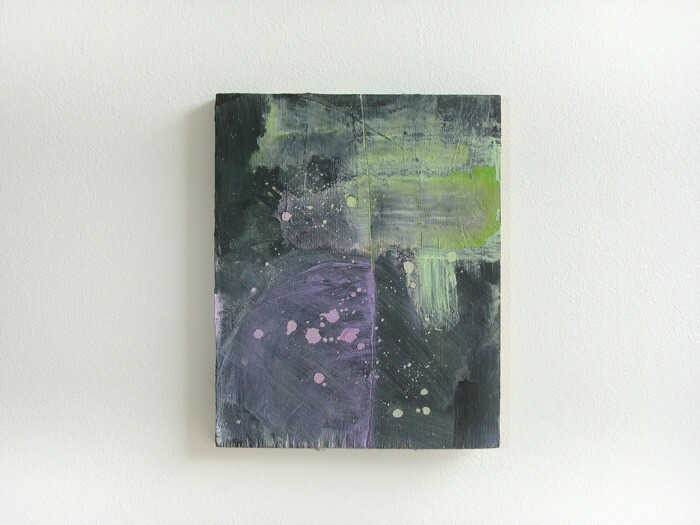 I hesitate to say ‘image’ because these small paintings have so much materiality about them, the paint often over spilling the edges of the canvas. It occurs to me that the tension that is created between quick graphic image and slow build-up of material is a large part of what I am finding so interesting in Greene’s paintings. 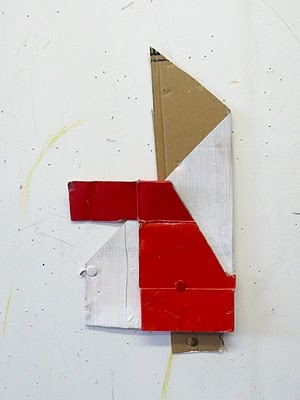 Something similar is going on for me in the paintings on plywood by Lisa Denyer. Their materiality is both posited and negated in the diaphanous quality of the resulting form. The word ‘image’ seems even less appropriate in that each piece looks so little like a picture of something other than space, and ‘object’ seems equally wrong because of the immateriality of the washes that the eye perceives more as gas than as liquid, despite the carefully crafted wooden support. There are four confident paintings by Matthew Macaulay on show here. 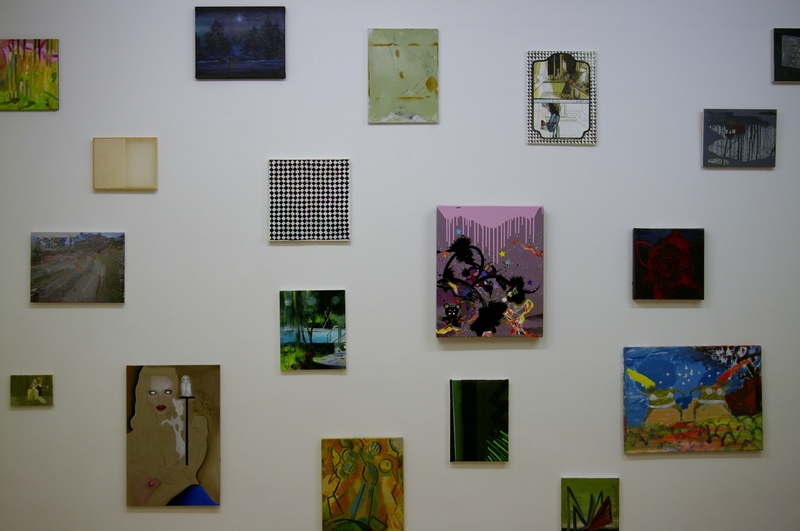 Two of them are painted on table tops, which lends them a solidity and a presence that seems to transform confidence into authority, especially so in the magnificent Thinking about Painting, 2103 (see installation shot above). Whilst the linear landscape format and the bold gestures in strong colour, for me recall Ivon Hitchens and Howard Hodgkin, there is something entirely contemporary in the experimentation with support and the unorthodox approach to ‘composition’, it might even be an anti-composition, approaching a cataloguing of visual statements, that resists, at least for a few moments, forming into a picture.